This was a lesson I learned not long ago when I was searching for help with marketing. Marketing focuses on advertisements, radio, TV, and newspapers—even blogs. Publicity is when OTHER people are talking about your book. A publicist is paid to pitch your books to magazines, TV, radio, etc in order to get reviews. They don’t pay for good reviews, just the attention you need for your book to be reviewed. Most large publishing houses will have an in-house publicist, but his or her attention is stretched thin between many authors. It doesn’t hurt to have your own publicist focusing on your book. You only have one chance for a first release. But brace yourself—this is another investment in your book’s future. The standard fee in the US is about $100 an hour. You should count on, at the minimum, 50 hours to start. It sounds daunting, but you are paying for their contacts and know-how. There is no direct correlation between your output and how many books you sell; don’t believe it if a publicist tries to make you any guarantees. Publicity is focused on the long-term. And what good are the reviews if you aren’t marketing them? Marketing and publicity go hand-in-hand. Talk to your publicist and get recommendations on the best venues to market that will work well together. Marketing is about the book you’re selling now. Hopefully that will bring in dedicated readers for the long haul, but the real focus is now and getting your cover in front of as many people as your budget will allow. 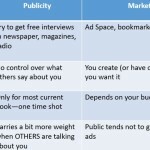 In a Jane Friedman blog post, MJ Rose lays out some interesting statistics about marketing and publicity (https://janefriedman.com/difference-marketing-publicity/). One I found to be a huge eye opener is 95% of all bestsellers spend more than $50,000 in marketing and public relations. Don’t get discouraged though; keep in mind that not everyone is meant to be a best seller. More than 85% of all books sell less than 1,000 copies. You CAN be successful without being a best seller. So come up with a plan that includes both marketing and publicity, and that fits your budget. Be realistic in your expectations. Your first time out, you are laying the foundation. With your next book or next push, that foundation will grow along with name recognition. This is a long race, not a sprint. Please feel free to share my posts.